This year Children’s Day marked the 125th birth anniversary of Pandit Jawaharlal Nehru (Chacha Nehru). Though belated here’s wishing all our children a very Happy Children’s Day! 🙂 I treated my son, Nehal and his friends to his favorite, Marble Bundt Cake, on this occasion . A simple, no frills, easy recipe for kids with vanilla and chocolate as the primary flavors. 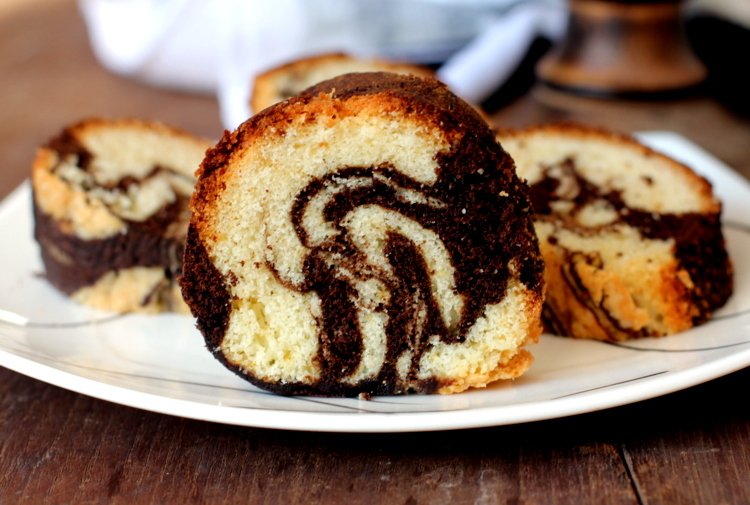 Those of you who are absolutely new to the nuances of baking might ask what is a marble bundt cake? Its nothing but vanilla cake batter that is swirled with dark chocolate cake batter in a bundt pan and baked to perfection. Learn more about bundt pans. 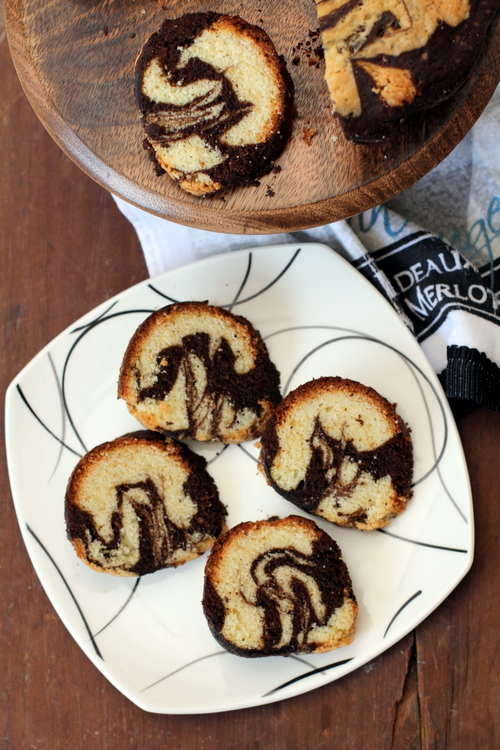 I followed award winning chef Sarabeth’s marble bundt cake recipe which is a keeper. An unbeatable flavor with a tender texture, nice crust and tastes better as it ages. An addictive cake that will have your friends swoon and ask you to bring it for every get-together you attend for the rest of your life. And its no exaggeration! Marbling the batter is easy peasy. Just spoon the vanilla batter and chocolate batter in a random manner and swirl a chopstick through the batter to create a marble effect. If you do not like to serve a plain cake, sprinkle some powdered sugar or pour a thin chocolate glaze or ganache all over and you are good to go. 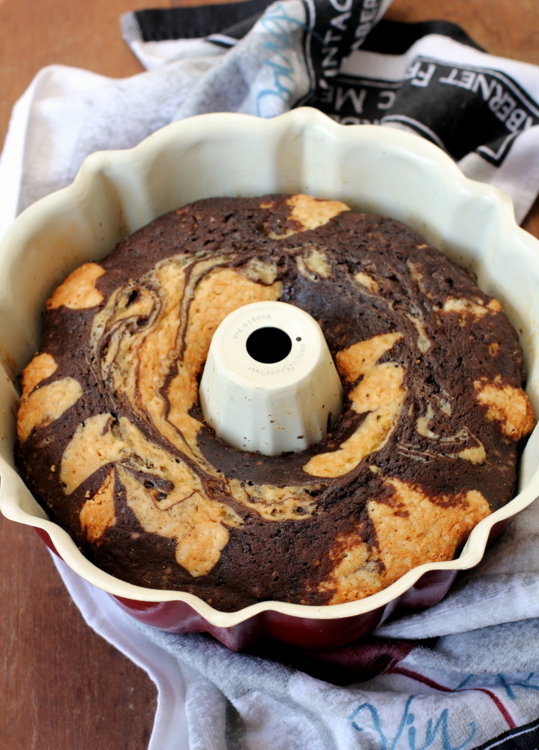 Honestly, this marble bundt cake needs no adornment. 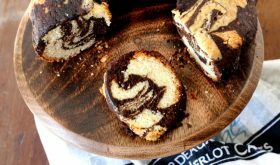 Just slice through and serve a piece of the marbled beauty with a cup of coffee for the adults and a glass of milk for the kids. You can halve the recipe and make a loaf cake. And cake baking enthusiasts, if you haven’t yet invested in a bundt pan then I strongly recommend you buy one. Preheat oven to 175 C (350 F) and position a rack in the center of the oven. Grease the bundt pan thoroughly including the creases and flour it well and tap out the excess flour. In a small bowl, add the hot water, instand coffee powder, cocoa powder and 3 tbsps sugar and mix till smooth with no lumps. Add almond extract and mix. Set aside to cool. In a medium bowl, sift the flour, baking powder, and salt. In a large bowl, add the butter and beat it till smooth for 2 mins. Gradually add sugar and continue to beat for 3 minsmi. Add the vanilla extract and beat till light in color, approx 4 mins. Gradually add the egg mixture and beat on low speed for a mt. Gradually add the flour in four additons and beat on low until just combined and smooth. Transfer a little less than half of the cake batter to the cocoa mixture and mix with a spoon until smooth. With the help of an 2 1/2" diameter ice cream scoop or large spoon, alternate scoops of the vanilla and chocolate batters into the pan. Take a chopstick and create a swirl all through the batters taking care not to touch the sides of the pan. Smooth the top lightly. Bake in the preheated oven for 55 to 60 mts till a skewer inserted in the center of the cake comes out clean. Check from 50 mts onwards. Cool on a wire cake rack for 10 mts and invert the cake onto the rack to cool completely. How to grease and flour a bundt pan - Grease the bundt pan with shortening or melted butter. Shortening is preferred. Use a pastry brush to grease and see that all the crevices are well greased. Add 1/3 cup of flour to the pan and cover the pan with a plastic wrap. Now shake the pan all around such that the pan is coated with flour especially the center cone. Remove the plastic wrap and tap the pan upside down and remove the excess flour. 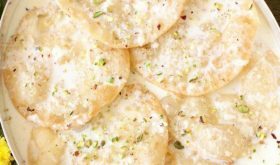 If you find that a few spots are not covered with flour, lightly grease those spots and again dust it with flour and remove all the excess flour. Do not fill more than 3/4 th of the cake pan with cake batter. I have used a 10 cup bundt pan. You can also use an 8 cup bundt pan. It means your bundt pan should be able to hold 8 or 10 cups of water (filled to the brim). By Sailu Published: November 15, 2013 Marble bundt cake is one of the best tasting cakes I've made that can also be made into a loaf cake. A tasty & easy recipe for kids. Happy Childrens Day. Definitely making this!1 thanks for sharing!! May I know which oven do u use for baking? I use an OTG, Murphy Richards brand. 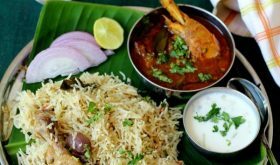 I love your blog – I am regular visitor of your bog since very L-O-N-G time – first time leaving a comment:) I have cooked so many great Indian dishes from here, your tips and tricks were always so helpful during cooking. Keep up the great work! awesome ! thanks for sharing ! Tried it out, came out very good. Thanks for sharing! Is there any difference between vanilla extract and vanilla essence? Yes, there is a lot of difference. Vanilla extract is made from vanilla pods while essence is chemically flavored. Essence is thinner while extract is thicker with a richer flavor and of course more expensive. 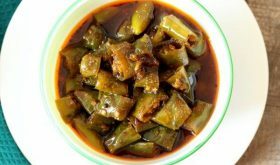 My neighbors are already asking me to make again… I love this recipe Sailu.. Thanks again for making our lives colorful with your recipes and wonderful photography..
Can I use this recipe with oil instead of butter? How much oil should I use? I just love the recipe and your bundt pan, may i know where did u get the bundt pan, it looks awesome too? Thank you. The bundt pan is from US. 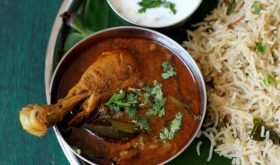 hi the receipe looks yummy…can i make this in cooker??????????? i love your blog and recipes. today, i tried this cake and came out really well. but i got a doubt, do we need to powder the sugar? first i put some of the sugar(granulated) as it is, then i got the doubt and i powdered the rest of the sugar. Fine granulated sugar works fine. I tried and it came out fabulous. Thanks for sharing this recipe. What temp in F would you recommend baking at? I baked it in U.S. at 325 degrees Farenheit. I always use a cake pan release that I brush on pans that is equal parts neutral tasting oil (like Canola or vegetable), flour and solid shortening (like Crisco). Mix all well and brush on. Also I let it cool 15 minutes in pan. Pls let me know if it will work with half the quantities?? I only have a 5 cup bundt pan..
Hello, can I substitute butter with vegetable oil? If yes, how much vegetable oil should i use? Thank you. Use 1/2 cup oil. I have never tried this recipe using oil, though. 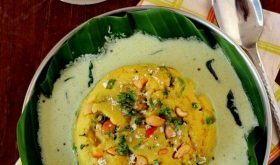 Hi sailu.. Can i make this recipe with half the quantities? Yes you can halve the recipe. Can we bake it in a normal cake pan? Hello, I realize this was posted some time ago, but I am just discovering your beautiful recipe. When is says “egg mixture” is it just the slightly beaten eggs, or is there something added to it I am missing? Thank you!